Harvey Potter was a very strange fellow indeed. He was a farmer, but he didn't farm like my daddy did. He farmed a genuine, U.S. Government Inspected Balloon Farm. So begins this enchanting original tall tale. Set in the rural south and populated with a truly unforgettable cast of characters--including, if you look very carefully, a rabbit, a Tyrannosaurus rex, a cat, a chicken, a cow, and a pig hidden in each remarkable illustration--this is a book that is filled with wonderful impossibilities and magical imagination. Told in the great tradition of summer nights and front porch yarns, Harvey Potter's Balloon Farm will lift your spirit right off the ground, just as it does Harvey Potter. Harvey Potter was a very strange fellow indeed. He was a farmer but not like any farmer you've ever met. He didn't grow corn, okra, or tomatoes. Harvey Potter grew balloons. No one knew exactly how he did it, but with the help of the light of a full moon, one friendly child catches a peek of just how Harvey Potter does it. And keeps some magic for herself. "This is the best sort of fantasy imaginative, inventive, and believable. 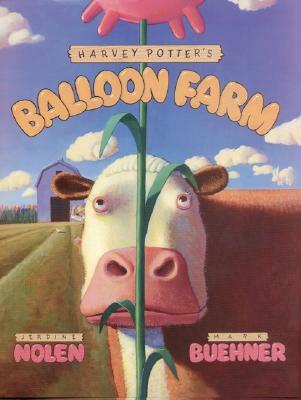 Harvey Potter is a wonder he's the owner of a genuine U.S. Government Inspected Balloon farm. And Nolen's tale about this man, narrated by the African-American girl who learns balloon-farming magic from him, is equally wondrous.... This title should sail onto every library shelf. May Nolen grow a bumper crop of books." School Library Journal. Marl Buehner has six little pilgrims of his own in Salt Lake City, Utah, where he lives with his wife, Caralyn, and their children: Heidi, Grant, Sarah, Samuel, Laura, and Jake. Mark has illustrated many wonderful children's books, including I Am the Cat by Alice Schertle and Harvy Potter's Balloon Farm by Jerdine Nolen.